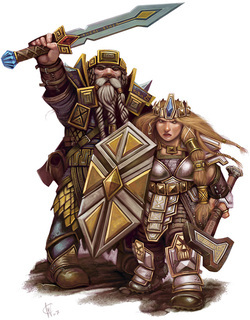 Short in stature but tall with bravery, Dwarves are one of the more heroic of Lerai's races. Preferring to arm themselves with hammers, axes, and shortswords, Dwarves were the most militaristic race until the Great Cataclysm. When the Old Ones awoke for the first time in centuries, they sent armies of the undead to attack the dwarves, forcing them from their deepest mines and into the very bastions of the Dwarven Empire. There, they made their last stand against the undead menace.